Recent estimates value rhino horn at nearly $30,000 a pound, more than the current value of gold. A majority of rhinos were killed South Africa’s Kruger National Park, one of the continent’s largest reserves, despite multi-million dollar investments in improved enforcement there. Faced with the unprecedented crisis, officials on Thursday announced intensified relocation efforts for vulnerable populations: 100 rhinos have already been moved to unspecified neighboring states, and plans are underway to relocate an additional 200 animals from Kruger to “strongholds” elsewhere in the country where poaching is less pervasive. WildAid’s goal is to measurably reduce the demand for rhino horn in China and Vietnam by countering myths of medicinal benefits and raising awareness of the poaching crisis in Africa. 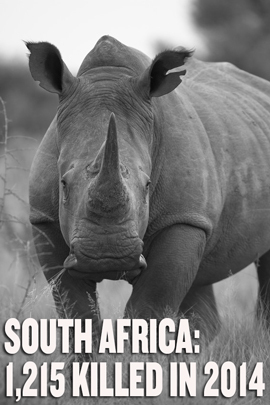 Read more on our rhino campaign here.